Built by a turn-key consortium of Bechtel Corp. and Siemens Energy Inc.
After the installation of 1.4 million linear feet of electrical cable, 113,161 feet of pipe, 890 tons of steel and expending more than 1.6 million man hours, Panda Power Funds’ 778-megawatt “Stonewall” generating station has achieved commercial operations. 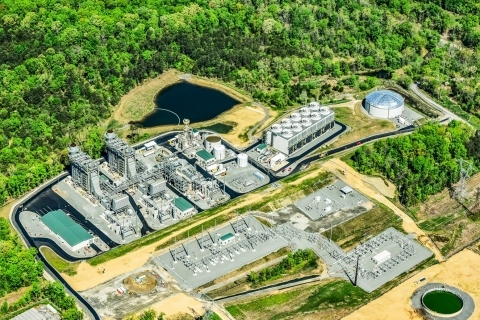 The Loudoun County, Virginia power facility was finished ahead of schedule and under budget, and initial tests show the plant is exceeding performance guarantees for both power output and efficiency. The plant is capable of continuously supplying the power needs of up to 778,000 homes in the Northern Virginia/District of Columbia metropolitan area. The combined-cycle generating station was built by a turn-key consortium of Siemens Energy Inc. and Bechtel Corp. Siemens provided the power island package — including the natural gas turbines, steam turbine, generators, heat recovery steam generators, and instrumentation and controls systems. Bechtel was responsible for the engineering and procurement for the balance of the plant, and the construction and commissioning of the facility. The Stonewall project is projected to contribute an estimated $7.1 billion to Virginia’s economy during the recent construction phase and the plant’s first 10 years of operation. Approximately 700 jobs were created to construct the power plant at peak construction. The plant employs 27 full-time employees to oversee operations and maintenance of the facility. The Stonewall project marked the sixth financing of a large scale power facility by Panda Power Funds in a three year period, then representing approximately $5 billion in total combined capital. The Stonewall facility itself raised debt capital of approximately $570 million. Panda Power Funds supplied equity capital for the power project along with large institutional co-investors, including Siemens Financial Services. The Panda Stonewall facility is strategically sited approximately 4 miles southeast of Leesburg, Virginia, in one of the fastest growing metropolitan areas of the United States. According to a June 2015 study conducted by the George Mason Center for Regional Analysis, the Greater Washington region is projected to add more than 410,000 new households by 2023 as a result of job growth. In addition, Loudoun County, dubbed “Data Center Alley,” hosts the largest concentration of data centers in the world. More than 70 percent of the world’s internet traffic flows through the County on a daily basis. The Panda Stonewall plant was purposefully designed to minimize impacts to the local community, utilizing advanced emissions-control technology. The generating station also uses reclaimed water from the Town of Leesburg to cool the facility, conserving the Commonwealth’s natural supply of drinking water. Putting to use reclaimed water that would normally be diverted to the Potomac River subsequently prevents the discharge of nutrients into the environmentally sensitive Chesapeake Bay watershed. Panda began site work of the Stonewall facility in mid-July of 2014 and issued a Full Notice to Proceed for construction of the plant in November of the same year. Gas can be supplied to the Stonewall facility from either of two 30” gas pipelines, individually owned by Dominion Resources and Columbia Gas, which pass through the plant site. The plant connects to the grid through an existing Dominion Virginia Power 230 kV line that traverses the site between the Pleasant View and Brambleton substations. Founded in 2010, Panda Power Funds is a private equity firm headquartered in Dallas, Texas, that develops, owns, operates and manages investments in clean energy. Panda has seven combined-cycle power plants in operation or under construction in Texas, Pennsylvania and Virginia with a combined capacity of more than 5,800 megawatts. Panda Power Funds also has a 990-megawatt power project in Maryland in advanced development. The fund built a 20-megawatt solar farm in southwest New Jersey that is one of the largest solar facilities in the Northeast United States. Additional information on Panda Power Funds can be found at www.pandafunds.com.